Listen, taste and travel through your body memories. Send us your taste with your voice, words and other means (via mic). Receive ours with your guts, heart and brain. In real time. Tasting Sound, Listening to Taste (a shared telematic journey through food and migrations) was a 20-minute improvisatory telematic performance, prepared for the Festival of Performances at the 2nd Deep Listening Art/Science conference, and created by Ximena Alarcón, Inês Amado and Ron Herrema in London, and with guests Sharon Stewart, Joe Patatucci and Jonathan Hoefs at Rensselaer Polytechnic Institute in Troy, New York. It took place on the 13th of July, 2014, at 1:00pm Troy time, and 5:00pm, London time. In the making of the initial menu, which we shared with our guests, we focused on aspects of relocation and transformation of sound and taste as they are mediated from one environment to another, one location to another location. 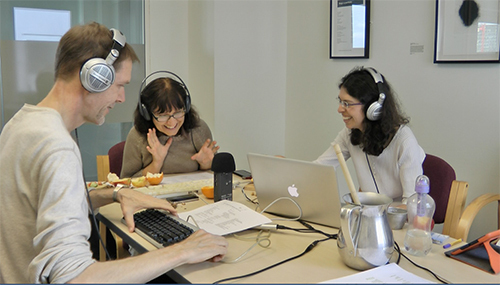 We invited them to exchange playfully experiences of taste and sound. What would be the sensation, the perception and the memory of tasting a sound made by the foreign ingredient, which helped make that sound? How do we experience the displacement, within our improvisation and how does it sound? 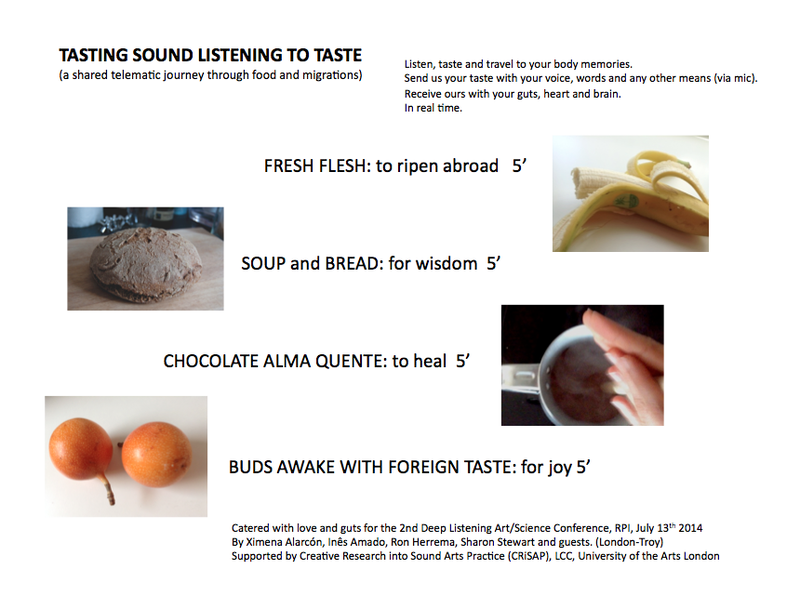 How does sound influence taste? And how does taste inform sound? Our menu was informed by spontaneous connections we made in our daily life with taste and sound, and which we were exchanging by texting each other via mobile phones; these texts created the material, which was used in the performance. We are migrants based in the UK, where people have and still rely on food from all corners of the world. Our experiences of food are enlarged by the fact that we have been recently identified as being allergic to certain foods, perhaps as a result of global mobility of food, and our bodies’ acceptance or rejection of these. Our bodies are silent witnesses of our process of geographical mobility. We intended to manifest the perception, intuition, sensation and feeling of the food we taste and the sounds it makes, while crossing the borders of our bodies and minds. A video with the sound of both locations is forthcoming. Here you can listen to a sound collage of some moments of the improvisation, from London’s location. Although Troy’s side cannot be heard; only as a distant voice as if it were a telephonic conversation (voice heard through the headphones), it is interesting to note our pauses, and synchronised responses to their sounds. We triggered pre-recorded sounds from computer keyboards via a PD interface created by Ron Herrema, and performed live sounds too. We connected via the software Jacktrip, and our sounds were played in the cafe area of EMPAC at Troy, New York, where our guests were, just before lunch. Special thanks to Dave Samson, from Rensselaer Polytechnic Institute (RPI), for his amazing and swift support for the technical setting (Jacktrip connection and amplification). Many thanks to the network support (IP addresses and ports) offered by Severin Adou and Santhanarajah Krishnarajah, at the University of the Arts London, and Dave Bebb and Brian Cook at RPI. Many thanks to all improvisers for this listening exploration of memories, sounds and buds. This performance was supported by Creative Research into Sound Arts Practice (CRiSAP), based at London College of Communication, University of the Arts London. This entry was posted in London-Troy, Telematic Sonic Performances on August 5, 2014 by xadiaz.